After accompanying his former chief of staff to register for June’s presidential vote, Iranian President Mahmoud Ahmadinejad may face punishment if charged with breaking electoral rules. On Sunday, the country’s electoral watchdog attracted worldwide media attention after pointing out Ahmadinejad may face a punishment of “74 lashes” for accompanying and appearing to endorse election entrant Esfandiar Rahim Mashaie. Iranian electoral law bans individuals from supporting candidates in an official capacity, while the use of state resources on behalf of or against any candidate is also banned. A conviction could bring a maximum punishment of six months in jail or 74 lashes, according to Iranian press reports. But analysts have brushed off “hyped” claims that Ahmadinejad would be penalized, and even if he were to be lashed or imprisoned, it may not be anytime soon. “There will be no lashing; the news is hyped and ridiculous,” Dr. Alireza Nourizadeh, the director of the Centre for Arab & Iranian Studies in London, told Al Arabiya English on Monday. “Yes, there would be a punishment if this were in a country that runs by law and order, with a strong judiciary that ensures laws and punishments are followed through. “But in Iran, most people break the rules, from the Ayatollah to the man on the street,” Nourizadeh said. The president had accompanied Mashaie on Saturday to register at the Interior Ministry. Photographs in the Iranian media showed them making peace signs. Mashaie said the president had accompanied him on “a day off” from work; a claim Nourizadeh says would be Ahmadinejad’s “innocent response” if ever he were questioned as to why he went. A spokesman for the Guardian Council, Abbas Ali Kadkhodai, said the council’s supervisory board unanimously agreed “the...actions of the president in introducing an individual as an election candidate constituted a violation and were criminal,” according to Khabar. “We reported the facts to the judiciary,” Kadkhodai said. The Guardian Council, a body of clerics and jurists, vets all candidates for elections. “If President Ahmadinejad had trespassed the electoral process, it’s up to judiciary to decide and not the Guardian Council,” Iranian political analyst and writer Camelia Entekhabifard told Al Arabiya English. However, the move by the Guardian Council could be a tactic to ward off the president from future interference in the elections. 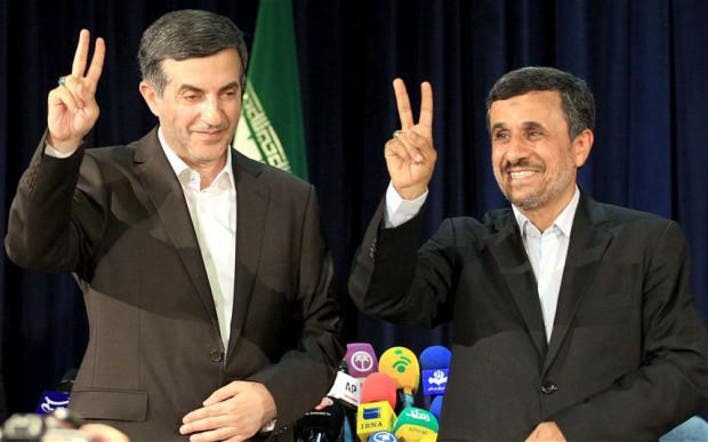 Ahmadinejad cannot run for a third term on constitutional grounds in the June 14 presidential polls. “Even if he is officially charged [over an electoral violation], he cannot be convicted before a trial. In this case, I think the Guardian Council wants to prevent the president from further interfering in the election in favor of his friend Mashaei,” Entekhabifard added. According to the Mehr news agency, Kadkhodai said election violations could affect the Guardian Council’s vetting process, suggesting Mashaie’s candidacy could be under threat. Iran’s ruling conservatives believe Ahmadinejad is trying to maintain influence through Mashaie assuming office, accusing him of pushing towards a more nationalistic doctrine and sidelining clerical powers in the country. “The only mistake Ahmadinejad made [while accompanying Mashaie] was raising Mashaie’s birth certificate in front of a reporter, implying not only that he is the president’s choice, but also that they are one – the same ‘type,’” Nourizadeh said. Although this may not lead to a “lashing” as such, Ahmadinejad may be forced to publicly back away from Mashaie, so as to not put his candidacy in jeopardy, added Nourizadeh. Tenth time lucky for Iran and the IAEA?